I don't usually post yearly goals, but when I was writing out my sustainable living goals for 2018 I realised there's an opportunity for us to help each other here. 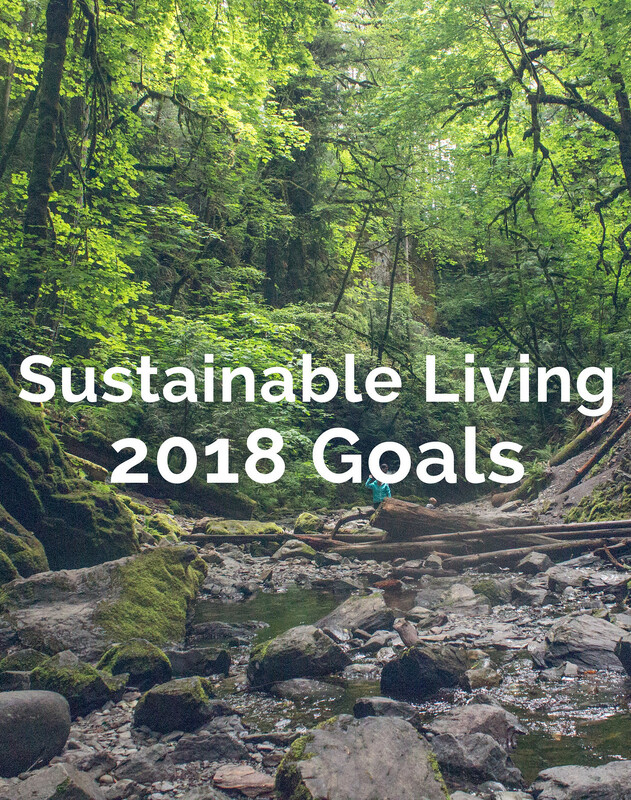 Yesterday, I posted seven tips to begin living more sustainably and I thought sharing our sustainable living goals would be a perfect way to set our intentions. I have found blogs and online friends so helpful for guiding me into a more sustainable lifestyle and I think we've got a good opportunity here to support each other. AND, we can collectively annoy supermarkets and brands until they put the planet before profit and make our lives a little easier. Sound good? Awesome. For me, the key is to set SMART goals (if you need help with that, here's a handy guide). I just can't write down something vague because I try to shake it off or interpret it a different way if I'm feeling lazy. If I know what I want to do and how to achieve it, I'm pretty good at doing it. Edinburgh have food waste bins, something we've never had before, so it was interesting to start separating that out. I don't think we do too bad a job in general, but occasionally we forget about leftovers and I'm pretty bad for letting fruit go gross. This year, I want our food waste caddy to only contain peelings, the odd tea bag if a tea drinker visits, and cat food - because the cat much prefers it when Daz feeds him and eats less when I feed him the exact same food. You know what? I was pretty afraid to include this one because I'm fairly certain I will fail at it at least once this year. Then I realised, the point isn't to perfectly achieve your goals from the outset; it's to try and achieve something new. Ethical and sustainable shoes are expensive (and I get why). In general, I don't buy shoes often at all. In fact, I think the only shoes I bought in 2017 were for work. I work in a restaurant so my shoes take a battering and the thought of spending a lot of money on something that I worry will wear out quickly makes my stomach knot a little. If anyone has recommendations for black, comfy, ethically and sustainable made shoes that won't wear out, I need to hear them. My wardrobe is a lot smaller than it used to be; ask my Mum. I did a good job of minimising my wardrobe in 2017, though there are a handful of things I want to make an effort to wear more, or donate. Less choice in my wardrobe is fine by me. To be honest, I'm fed up of putting all my clothes away. Less clothes = less clothes to put away = happy me. It's definitely going to take some time to get this one nailed. Again, this seems like a really easy thing to do, and it should be. Until your supermarket tries to make it impossible for you. My local supermarket decided to do away with paper mushroom bags and replace them with those crappy plastic ones. And the packaged ones have non-recyclable film. I need to get some produce bags and start shopping for produce somewhere else. Those are my five sustainable living goals for 2018. There will definitely be other things I'll achieve this year in terms of living a more sustainable life, but I think these are the bigger goals that will take more time achieve 100%. Oh man, if this blog post was a drinking game every time I said 'sustainable living' in that post, we'd have been smashed before we made it to the end. Tell me about your sustainable living goals, and let's help each other out. We got this; let's make David Attenborough proud.